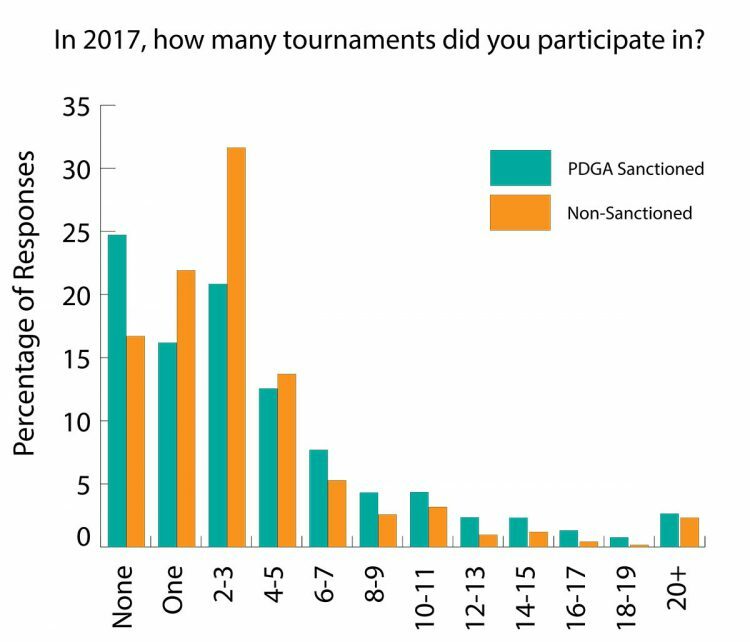 One of the questions on the 2018 State of Disc Golf Survey asked disc golfers how they feel about out-of-bounds rules. It was a straight-forward question and the breakdown of the responses is pretty basic. While some players feel strongly in favor of, or against the use of “OB” in the game, most players seem indifferent and feel like the use of Out-of-Bounds is generally fine. It appears that most players understand that OB lines can be necessary to discourage players from crossing fairways or throwing toward areas where discs shouldn’t fly. But when it comes to adding more OB’s just for the sake of adding difficulty to the course, slightly more players appear to feel that it can go too far (16.9%) while a slightly smaller number feel like more OB lines add to the experience (14.8%). We asked our own crew what they felt about OB lines, and while most are as indifferent as the majority of survey participants, the most poignant response was from our Open level player. He basically said that OB’s which are drawn artificially around naturally occurring hazards, like trees or rough terrain, should be removed. Why? Because if you throw into those areas, then navigating out of the rough terrain or throwing out of trees can be like a penalty stroke already– you either pay the price by wasting a throw to get back onto the fairway, or you prove your skill by escaping unscathed. He feels that any time a stroke is added to his score card that he did not throw, it is unwarranted. The exception would be obvious out-of-bounds lines that protect other fairways, roads, foot traffic areas, etc. If you have opinions about OB’s that you’d like to share, please feel free to leave comments below. 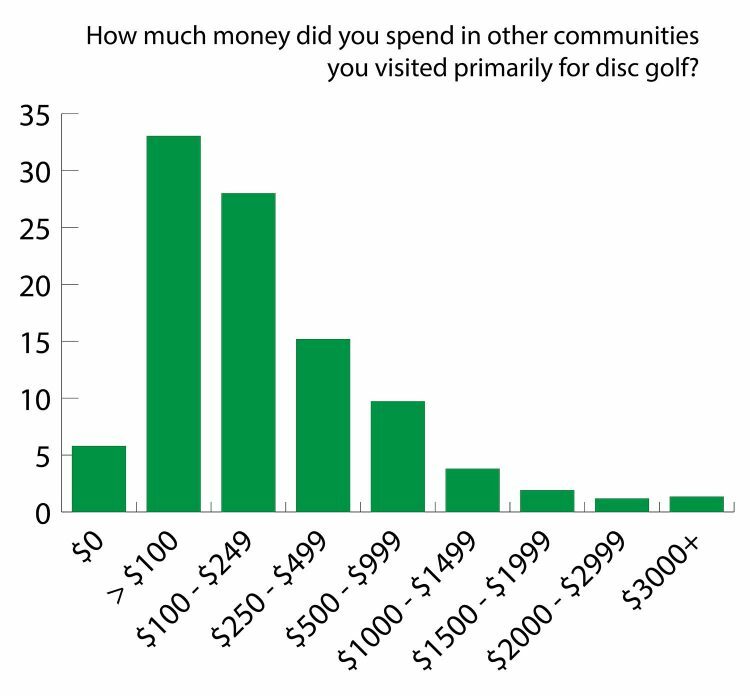 It is always interesting, particularly for those of us working in the disc golf industry, to look at the State of Disc Golf survey responses concerning spending habits and what motivates players to buy discs. Of course, just playing the game at all requires a certain number of discs. But how many of us go beyond what we really “need” to play the game when it comes to purchasing more and more discs? From the above results, a few things can be noted. For one, people tend to experiment more with favorite manufacturers, though there is a good number (majority) of players who don’t mind experimenting across brands. It also looks like it is a minority that only buys to replace lost discs– that means more players are buying for other reasons. One of those reasons might be collecting, but when asked if they only buy to collect, the vast majority didn’t feel like that described their buying habits. Around 25% swayed toward buying to collect, if only occasionally. The last graph shows that despite the motivation for buying, the majority of those surveyed throw every disc that they buy. Only 17.4% does not throw all of their purchased discs. How Likely Are We To Pay Extra for the Stamp? Another motivating factor for buying discs is the design of the stamp on the disc. We asked survey participants how likely they are to pay extra for a special stamp in the same mold, weight, and color that they could have purchased in a cheaper, stock stamp. Though the “buy to collect” market may be small, the larger “buy to throw” contingency is definitely not opposed to spending more for a stamp design that they like. How likely are you to pay extra for a special stamp in the same mold, wight and color as the stock stamp? That is only 14.7% that claims it is very unlikely that they’d pay more for a cool stamp design on their disc. 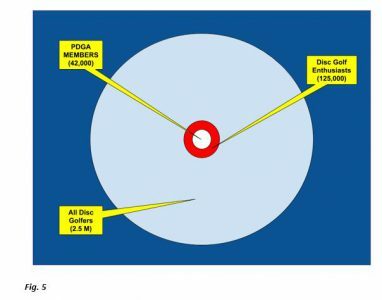 We’ll continue to follow disc purchasing trends and opinions closely! 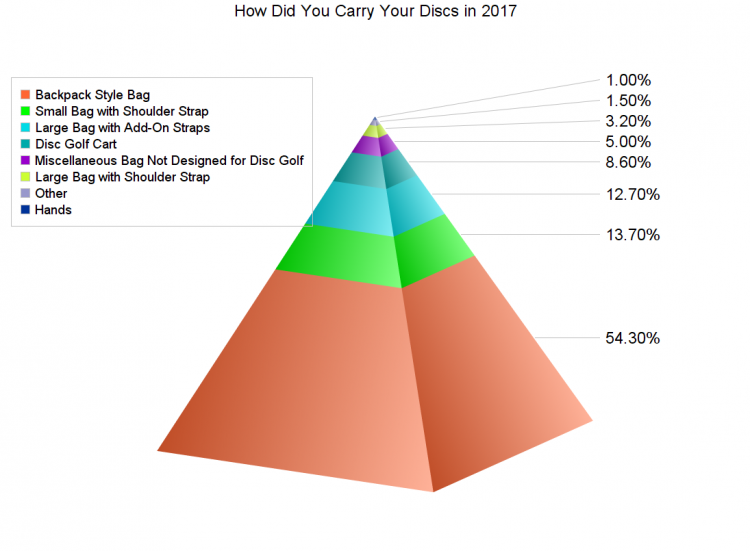 The State of Discgolf Survey has been tracking the trends in disc golf bags and the different ways that we carry our discs around the course. The trends leaned from traditional shoulder bags to a strong surge in backpacks, and has been moving steadily toward carts for the last couple of years. 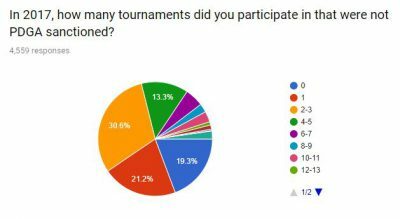 Here is a look at the survey results for 2018. Where disc golf carts used to be 4th place at 8.6% of survey participants, carts are now 2nd place at 15.47% of survey participants. The percentage of small bag users has dropped from 2017 to 2018 but still remains a good portion of players that prefer to travel light. It appears the the trend is generally away from larger should-strap bags (even with added straps for backpack-style carrying) and toward either backpacks or carts, with small bags holding ground. 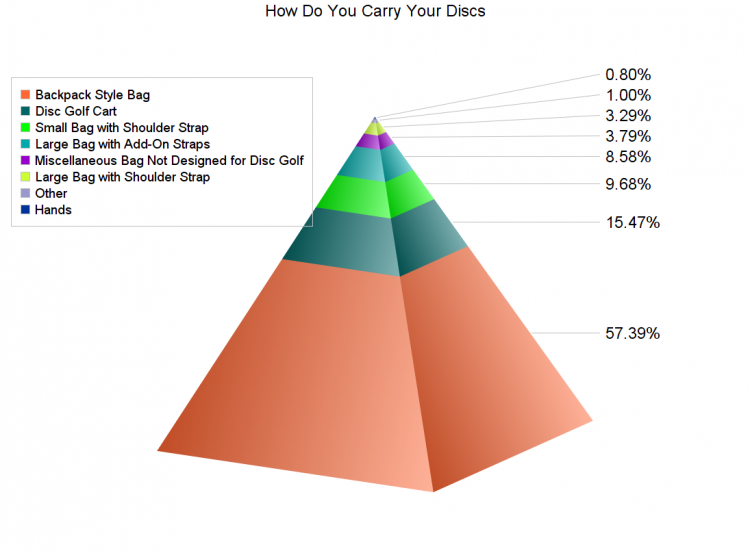 Going back to the 2015 survey, large disc golf shoulder bags accounted for 34.4% of those surveyed. That percentage has been cut to a third in 2018 with a total of 11.87% using large bags with or without straps. 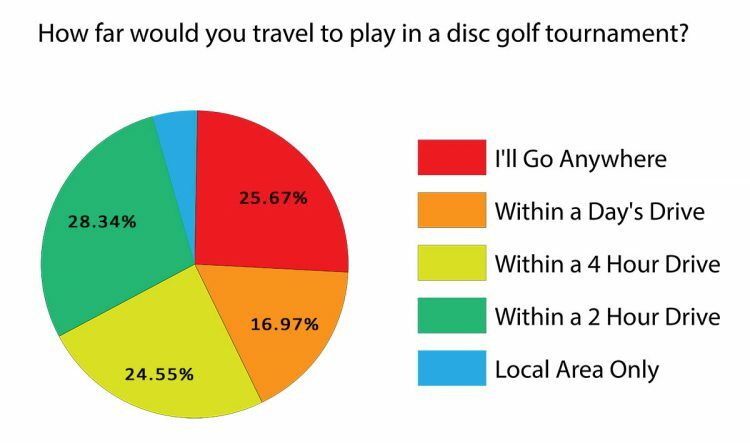 Disc Golf Carts were not included separately in the survey in 2015 and would have fallen into the “other” category which amounted to less than 3%. Carts are definitely an exploding part of the market. 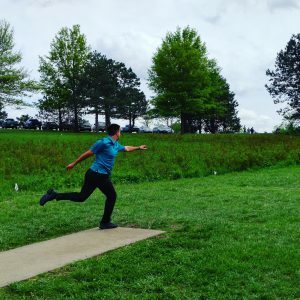 State of Disc Golf – What Brands Do You Know and Throw? 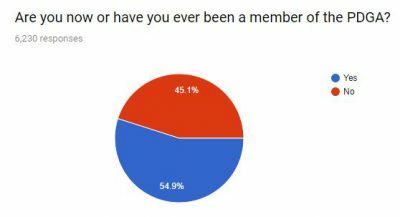 In the 2018 State of Disc Golf Survey we asked some questions that we love to ask every year– we want to know which brands are most recognized and loved, plus how many players bag discs by those brands. Sometimes we see an imbalance between brand awareness and loyalty vs. what is actually inside a player’s bag. For example, last year we discovered that while more people claimed that Dynamic Discs and Latitude 64 were their favorite brands, there were actually more people who had Discraft in their bags than those who bagged Dynamic Discs or Latitude 64. Let’s take a look at how those results panned out in this year’s survey. First of all, this chart excludes any brands that were under 1% of survey participants claiming to bag the brand. The “Regularly Follow the Brand” data is made up of those participants who said that they regularly follow the brand as apposed to “not aware of them,” “heard of them,” “I know some things about them,” etc. In other words, we only included the data where players ranked the brand the highest in terms of awareness. Innova has taken the top spot again in terms of high brand awareness with Dynamic Discs, Latitude 64, and Westside (all Trilogy brands) following behind. 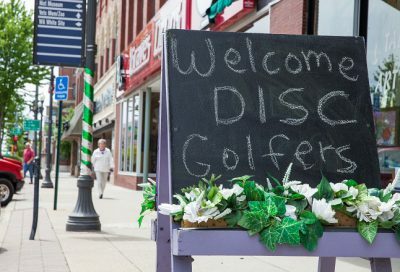 When it comes to bagging the brand, Discraft has now fallen right behind Dynamic Discs, but is still in front of Latitude 64. That is still a big disparity between people who regularly follow Discraft and those who bag Discraft — while they don’t follow the brand, they do have Discraft discs in their bag. It’s probably safe to assume that the extremely popular Buzzz mid-range has a lot to do with that. 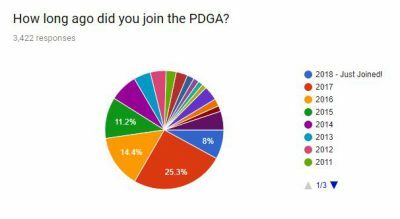 Discmania is also making great headway in terms of the number of players who bag their discs, and their brand awareness is also growing rapidly. MVP and Axiom have picked up in the number of players bagging their discs. The awareness of those brands has also pulled up the awareness of their newer spin-off brand, Streamline, though not as many people bag that brand yet (at the time of this survey there were only two Streamline molds). The rising of other smaller brands in awareness and disc use, like RPM, Mint Discs, Kastaplast, Hyzer Bomb, etc. is encouraging in showing that more players are becoming aware of newer or smaller brands, and are more likely now to add their discs to bags when compared to previous years. 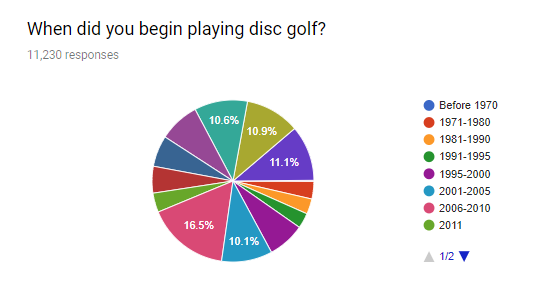 We also asked survey participants this question: If you could throw discs made by only one manufacturer, which would it be? 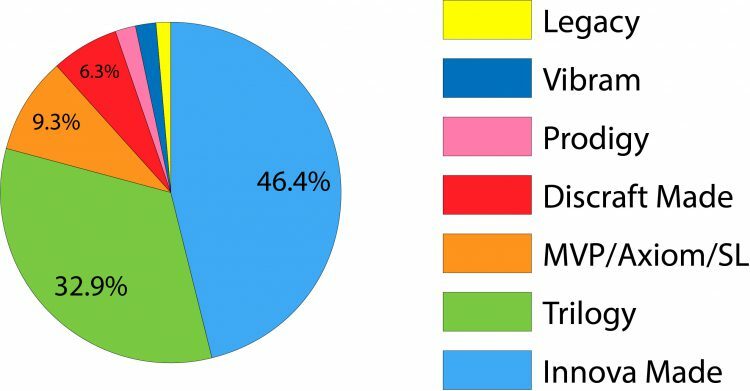 The “Innova Made” brands took the lead with 46.4% and that includes brands like Discmania, Hyzer Bomb, and Millenium, which are all manufactured by Innova. Trilogy came in a strong second with 32.9% and that includes the brands Dynamic Discs, Latitude 64, and Westside. MVP also manufactures Axiom and Streamline Discs, and they now take up third place with 9.3%. Though quite a bit behind the two leaders, they are a fast-growing part of the disc golf market. 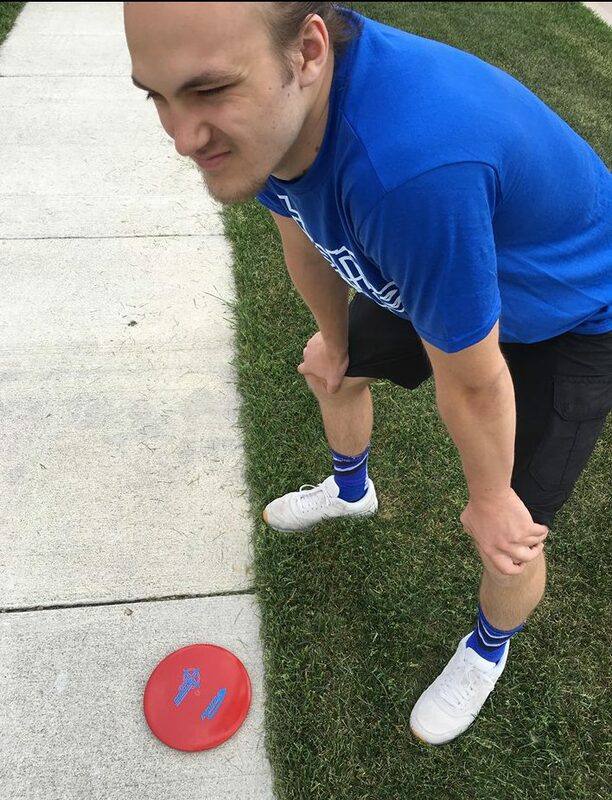 They passed Discraft this year to take that third place spot. Another ironic move in this year’s survey is that Vibram jumped into sixth place where they didn’t even hit the top eight last year. But since the survey they have opted to exit the disc golf business. Finally, we asked if survey participants had changed their favorite brand during the last year. The majority 74.5% said that they did not change favorite brands, while the other 25.5% said that they did. So, a quarter of disc golfers changed brand loyalties last year, showing that the market is still fluid when it comes to branding. This week we’re going to look at what types of Disc Golf Courses we like by examining our vegetation density and course length preferences. We will first take a look at the vegetation density, broken down by skill level. Right away we see that Beginners like moderately wooded courses just a tad more than lightly wooded courses, but they are almost equal. However, Intermediate players vastly prefer moderately wooded courses. My speculation is that Intermediate players want more of a challenge, and they enjoy taking their game to the next level by having more trees to throw through. Once players reach the Advanced and Professional levels though, the lightly wooded courses take a step back up to nearly 25% of preferences. Moderately wooded courses still reign supreme, while thickly wooded and wide open courses remain a minority. This could be because Advanced and Professional players are competing more, and courses with too many trees could add in some unlucky tree hits and kicks, hurting players scores. Yet, these players still prefer moderately/lightly wooded courses because it adds far more technique and skill than a wide open course. 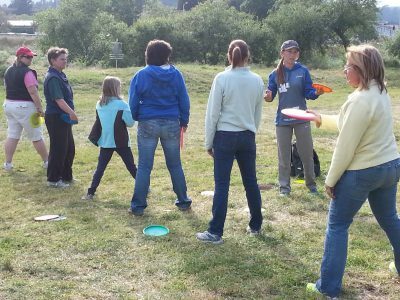 We don’t see any vast differences between Male and Female disc golfers’ course preferences. The only noticeable difference is that males seem to prefer moderately wooded courses a bit more. Now, taking a look at length of course preferred by survey participants. Here is a break down of the course distances broken down by the survey. This is what you would likely expect in course length preferences, broken down by skill level. 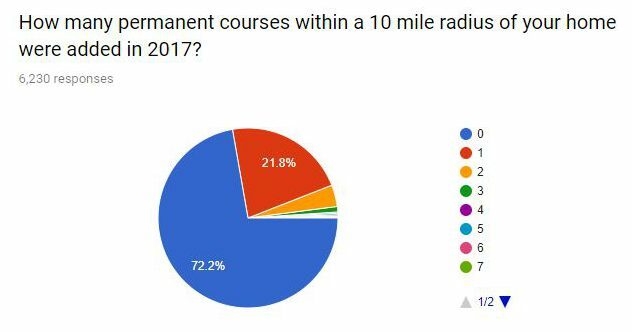 Beginners mostly want the moderate length courses. Intermediate players like the same, but with a growing percentage of people enjoying the longer courses. Advanced players have a larger percentage who enjoy pro level courses and longer courses, while moderate still reigns supreme. Professionals (with good reason) prefer pro level courses more than others, but still enjoy an equal mix of moderate and long courses. Short course preferences are all but lost among the higher skill levels. I’m led to conclude that as your skill level goes up, the more likely you are to enjoy a longer course. This is what I predicted before examining the data, and you probably did too. Let’s take a look at our summary of course preferences of every player. These results show that the most preferred course type is Moderately Wooded with Moderate Length. This is followed by Lightly Wooded and Longer Courses. Lastly we’ll take a quick look at how many courses we played in 2017, by skill level. The results are also to be expected. As skill level rises, the average number of courses played last year rises. However, in every skill level, the most common answer was 10-15 courses played last year. 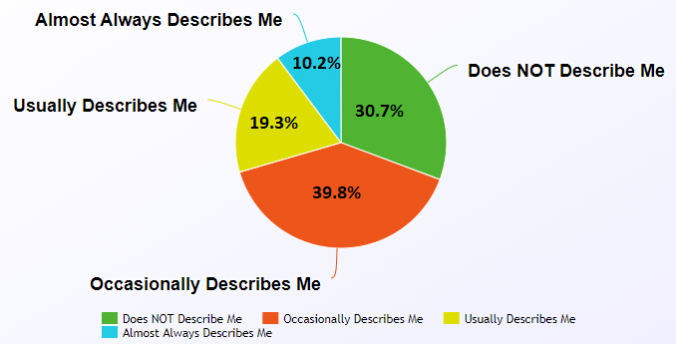 It was the 2nd and 3rd most common answered that varied by skill level, slightly rising with each division. In conclusion: We love Disc Golf, and as we get better at it, we want to play harder courses and we want to play more courses. This is to be expected! The only response that was not linearly effected by skill level, was the intermediate players preference to course vegetation density. It dramatically increased from beginners, and then dropped back down with advanced skill level.